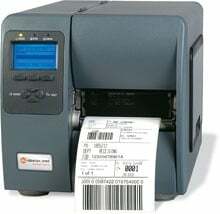 Datamax-O'Neil I-4212E - Thermal transfer printing, 203 dpi, Ethernet, Serial, Parallel, and USB interfaces, Cutter, Real-time clock. Cables sold separately. See accessories. Versatility that will increase productivity. Datamax-O-Neil's I-Class revolutionized the barcode printer industry with its award winning modular design, field installable options and rugged reliability. For the past several years, resellers have named the I-Class the "best channel product" in some of the industry's largest third-party surveys. Now we"ve raised the bar even higher, with the redesigned I-4212e. The DMX-REW1 is a low-cost universal label rewinder/unwinder supporting labels up to 5 inches wide at speeds of up to 15 ips (ips). Any rewind core from 1 inch to 4 inches in diameter can be used. Label rolls up to 8 inches in diameter can be accommodated. 2.0" x .25" Thermal transfer synthetic electronics component label. 1 across. 10000 labels/roll, single roll. 3" x 1" Thermal transfer paper label. Not perforated. 5500 labels/roll, 8 roll case. 4" x 6" Thermal transfer kim-syn paper label. 1,000 labels/roll, 4 roll case. 4" x 2" Direct thermal paper label. 2900 labels/roll, 4 roll case. 4" x 6" Thermal transfer paper label. 1,000 labels/roll, 4 roll case. Also available as a roll (Part# 420970-R). 4.25" x 1182' Black Chemical Resistant Resin Ribbon. Compatible with Industrial Printers. 24 ribbon case. Used with polyester labels. Also available as a single roll (Part# 295706-R). The Datamax-O'Neil I12-00-48040L07 is also known as DMX-I4212ECUTTTLAN	or I120048040L07	.